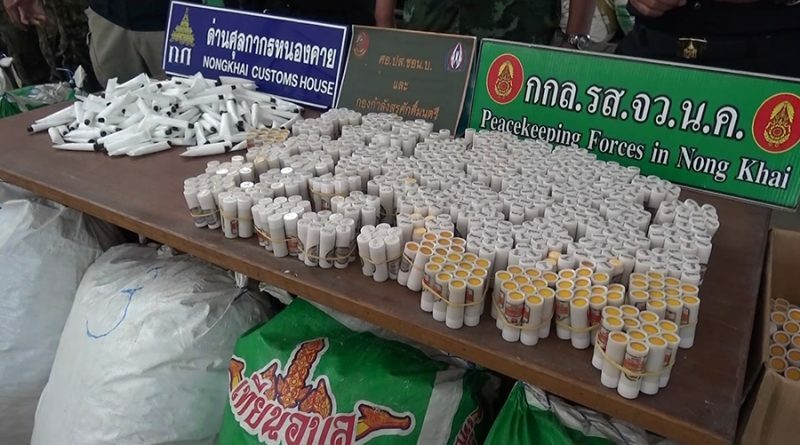 The Nong Khai customs house and the Peace Keeping Forces in Nong Khai were able to catch 2 men with loads of unregistered cosmetics making their way into Thailand from Laos. They were on their way to deliver the goods to a customer in Thailand. The unregistered cosmetics included items such as makeup and even skincare. 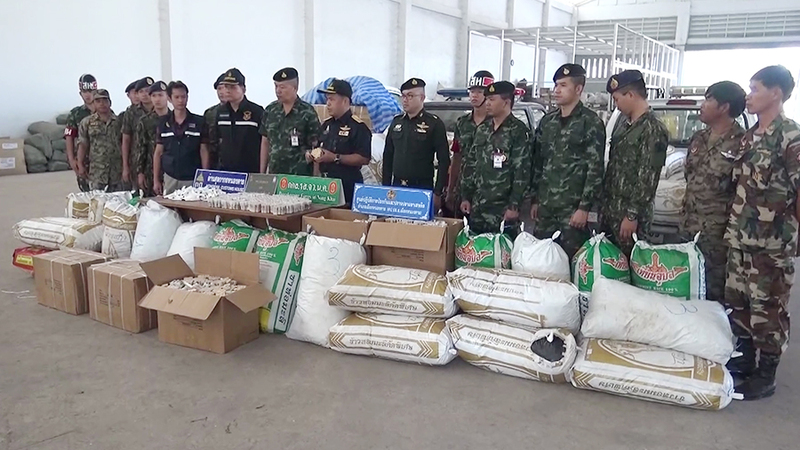 Sombat Konthong from the Nong Khai Customs House along with the Nong Khai police and officers belonging in the Nong Khai Customs House and the Peacekeeping Forces in Nong Khai reported to the public about the catch on the 5th of this month. Supot Tannarat 68 years old lives at house address no.3 in Nong Khai city and Tanawat Wisetsunthorn 29 house no.214 in Nong Khai city were arrested along with 40 large sacks of cosmetics including skincare. The 40 sacks were seized along with a White Suzuki truck and a boat that was used to cross the river from Laos to Thailand. The unregistered cosmetics are worth at least 1 million THB including taxes. 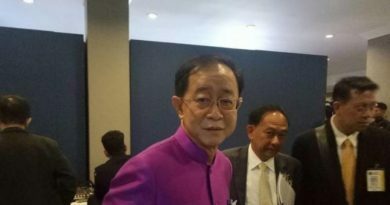 Sombat Konthong reported that at about 8 PM of the 4th customs officers were notified of a smuggle planning to take place on unregistered cosmetics coming into Thailand from Laos. 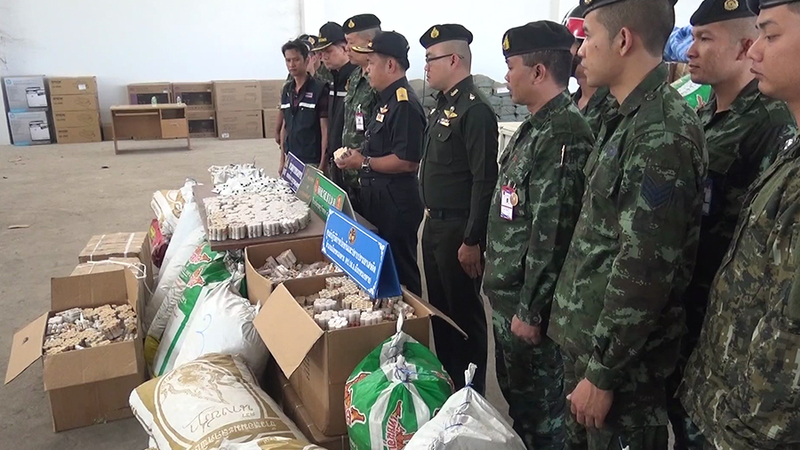 The customs along with the Peace Keeping Force went to Pakoh sub-district in Nong Khai city where the smugglers were planning to enter with the unregistered cosmetics into Thailand. Both of the smugglers were caught right where the information stated they would be at. The smugglers were arrested while moving the sacks from the boat onto the white truck. Most of the cosmetics consisted of skincare that was made in Vietnam. Both of the smugglers stated to the police that they bought the cosmetics from a female seller in Laos. They were supposed to bring the cosmetics to the buyer in Thailand 3 times. 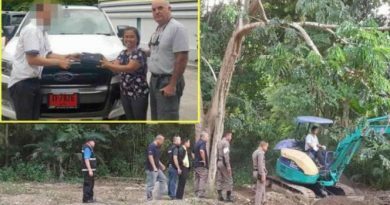 They would receive 3,000 THB per delivery, but sadly they were caught by the officials since their first try. Although they admit that they have smuggled other products into the country before. These cosmetics are unregistered and are unknown to where they were made and the ingredients used to produce these cosmetics. The customs will be seizing all of the products and will be sending a sample of the Vietnam cream to the Food and Drug Administration to be tested for any harsh and illegal chemicals. Both of the men will be prosecuted on charges of illegal smuggling into the country. FB Caption: Over 40 sacks of cosmetics were seized as they were traveling from a neighboring country into Thailand. ← Cost of living in Bangkok is the 2nd highest in ASEAN.